To quantify and increase the understanding concerning basic hydrological and biological processes in the soil-plant-atmosphere system. The model simulates soil water and heat processes in many type of soils; bare soils or soils covered by vegetation. The basic structure of the model is a depth profile of the soil. 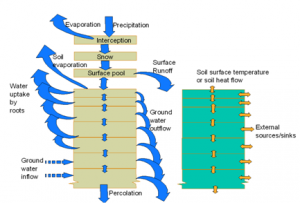 Processes such as snow-melt, interception of precipitation and evapotranspiration are examples of important interfaces between soil and atmosphere. Two coupled differential equations for water and heat flow represent the central part of the model. These equations are solved with an explicit numerical method. The basic assumptions behind these equations are very simple:· (i) The law of conservation of mass and energy and· (ii) flows occur as a result of gradients in water potential (Darcy’s Law) or temperature (Fourier’s law).The calculations of water and heat flows are based on soil properties such as: the water retention curve, functions for unsaturated and saturated hydraulic conductivity, the heat capacity including the latent heat at thawing/melting and functions for the thermal conductivity. The most important plant properties are: development of vertical root distributions, the surface resistance for water flow between plant and atmosphere during periods with a non limiting water storage in the soil, how the plants regulate water uptake from the soil and transpiration when stress occurs, how the plant cover influences both aerodynamic conditions in the atmosphere and the radiation balance at the soil surface. All of the soil-plant-atmosphere system properties are represented as parameter values. Meteorological data are driving variables to the model. Most important of those are precipitation and air temperature but also air humidity, wind speed and cloudiness are of great interest. Results of a simulation are such as: temperature, content of ice, content of unfrozen water, water potential, vertical and horizontal flows of heat and water, water uptake by roots, storages of water and heat, snow depth, water equivalent of snow, frost depth, surface runoff, drainage flow and deep percolation to ground water. In addition to the water and heat conditions also the plant dynamics and related turnover of nitrogen and carbon may be simulated. The abiotic and biotic processes may be linked in different ways also to handle the feedback between the physical driving forces and the plant development.